Hiya, everybody. I bid you welcome to my artistic collection or museum whichever may come to mind. 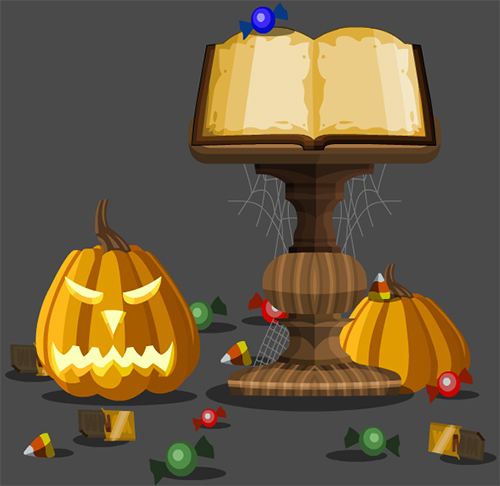 You may have seen me around wandering in the DF Encyclopedia shelving bits of information about the world of DragonFable. It runs in my enjoyment in discovering new things and uncover untold secrets about the world around me. This gallery is certainly no exception. Here, you will find artwork ranging from weaponry I crafted to characters I made and much more. I hope my collection fascinates you and I'm always eager to read your thoughts so I can make improvements and changes if need be. 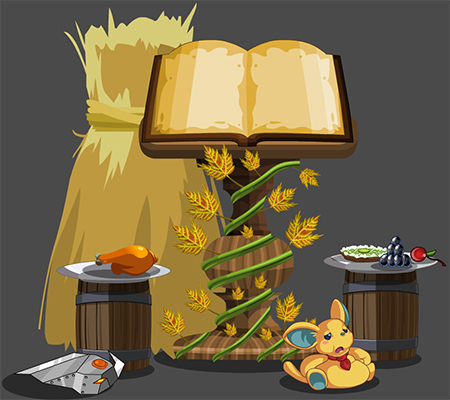 I'd just like to point out that there are some of my designs that do contain some existing in-game art assets from DragonFable that I either use as decorations or props in an animation. I'm also an EpicDuel guest artist so if you like to view art from the game and some MechQuest-related artwork, it is stored on my Deviantart page. They should be easy to find in that gallery. A treasured stone sword sought out by crystal hunters and stolen by desert thieves. It lands in your possession. Hopefully, it is yours to keep for good. 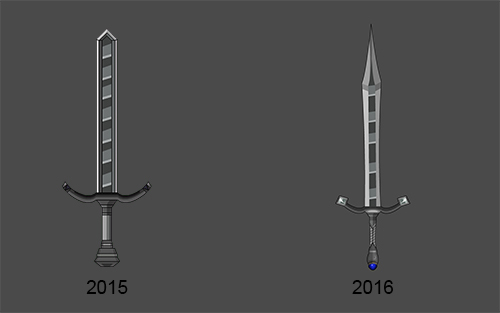 The sword is one of the first designs I drew in Flash when Seth Juron was teaching me the basics. I'm still proud of how it turned out to this day and the image is a redesign that cut out most of the white lines. Crafted from concrete and light-colored onyx in a tower in the Badlands, this heavy blade is commonly used by more daring adventurers. The HeadStrong Tower Blade had a ton of lines and lacked variation when I first made it. I'd like to thank Laken for his advice regarding line usage and since I received it, I've been choosy of where to use my lines in my designs. Fueled by ambition and rage, the fiery magic drains harmful feelings in your psyche by turning them into scalding fire, decimating enemy defenses while your mind cools down. Considering that fire is a symbol of rebirth and balance, the sword's power fits its description. Enclosed is a link to the animation of rocks flowing down the lava river in the center. A unique and long-lost sword that comes with a magic mirror. Upon gazing at it, the reflection reveals what its wielder looks like based on his or her personality traits. Use it carefully and use it well. 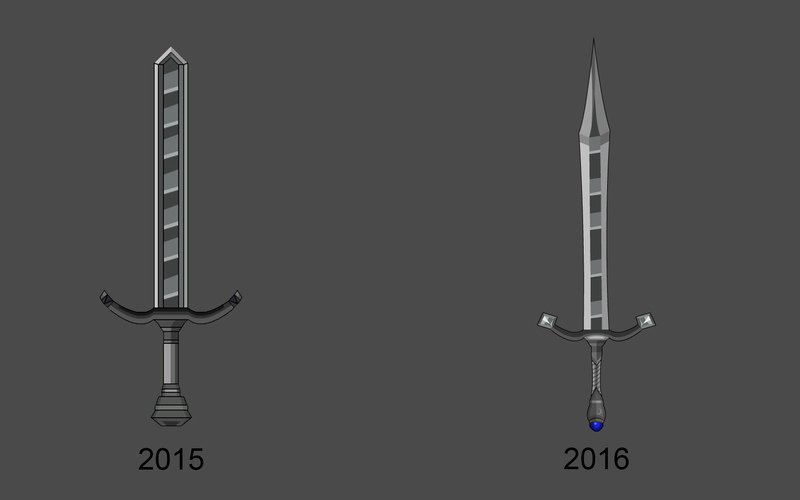 This gray-colored sword was made from a collaboration between Valoroth and I, which helped me understand shading much better. Dragonlord Occavatra carved this powerful spear fueled with earth magic in honor of geopetal who has departed to travel on a new adventure. Here’s to the Rock Star! 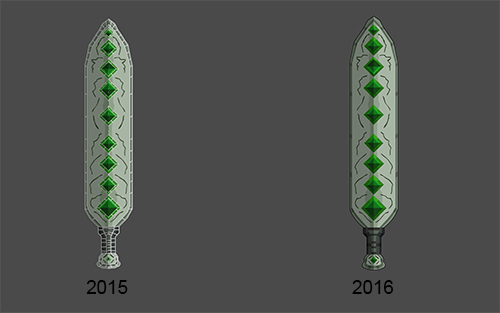 The glistening emerald spear that I made last August as a tribute to one of my role models who inspired me to keep writing and helping the DragonFable community even after her departure to go on a new adventure. I would like to thank Geopetal so much for doing just that for me and I definitely hope for all of you as well. The armor started out as being entirely red until I was given advice by Charfade to darken portions of the armor where light doesn't hit and add some more purple. The crystals on the armor are amethysts except for the necklace, which is a Void Crystal. In that case, how Occavatra came to find it is apparently a mystery. Irene is an aeromancer that uses leather leggings and spiky cleats for defense and to protect herself against major blows. Although Seth Juron helped me give the gauntlet a different color to have her right fist stand out more, I believe her hair and dress could use some more work. I have not yet been able to properly design clothing and hair, but I'll leave an update once I get to a redesign. Any advice for coming up with ideas for DF characters? 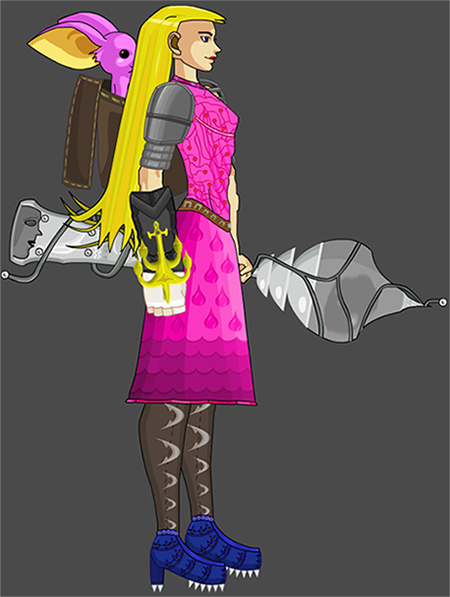 Annapurna is a minor character in DragonFable who looks to Warlic to guidance, but not much is known about what type of magic she possesses other than the fact she may have some of it from the Spellberries she provides to adventurers who live in or travel to Falconreach. My hypothesis about her magic is that she is an excellent healer like Twilly is and has the ability to launch balls of lightning that are shocking to a minor degree, which connects to the fact she looks up to Warlic as a hero. Both moglins have taught Irene healing abilities, allowing her to become one of the most talented and skilled healer on Lore. Occasionally, Irene would allow Annapurna to tag along with her on an adventure. That is why she is in her knapsack as shown in the image and animation. When it's time for Annapurna to attack, she jumps out and launches several balls of lightning at Irene's foe before returning to the knapsack. A majestic structure-like weapon said to contain the breath and possibly the life force of Zyphos, a wind titan that once hailed from the Dwarfhold Mountains. This is an ancient staff that has been in Irene's possession since she was a little girl. Although aeromancy runs through her veins, Zypho's Breath provides an accelerated boost in strength for her. This allows her to knock down a Gnomish Personal Steamtank on its side, a feat that she could accomplish by performing the stomp attack in her Book 3 animation. The staff is one of my earlier designs from last year, but although it is much better, it's another weapon that could still use some improvement in its shading and vine-like structure that loops around her staff. Once I get to it, I'll add an update. It's almost time for Mogloween so I spent the entire month drawing up the collector's edition of the holiday's storybook. It's no different from the book you get once a year except the copies are extremely rare and cost several fortunes to purchase. How come it is so? In order to combat propaganda the Rose is spreading through the Kingdom of Greenguard, Occavatra and co. have been distributing copies of the storybooks such as this one to common citizens in order for them to appreciate magic on Lore for the way it is, but not everyone got one and whether more will be published for others to read remains unknown for the time being. Until then, happy Mogloween. I would like to give a huge shout-out to Ergotth, Platinum Lady, and Akriloth for their advice and helpful feedback throughout the process I was working on the pedestal, book, and placement of seasonal decor around it. It helped me a lot and I am grateful for that. I feel compelled to say, Occatrava's armour is certainly eye-catching. The gradients make it look 3 dimensional- more so than the assets in-game from Dragonfable, which use about three shades for any given material. Bearing that in mind, make sure you keep the styles consistent. Occatrava works because his clothing is consistently shaded with a gradient. Because his skin is a different type of material, the fact that it has three shades isn't as noticeable. Whereas Irene's depth shading is all over the place; the dress looks flat, while the shoulderplate and anchor are heavily shaded. I think the problem arises with the fusion between DF's style and your own shading style. DF uses a posterized colouring effect, while you've used a gradient-based style. Both have their advantages; just try and keep it consistent within any particular piece. My favourite weapon is probably the Headstrong Tower Blade. It looks so elegant. I can already imagine impaling my enemies with it using it to aid me in my moglin-hugging endeavours. On the whole, I do quite like your gallery. Keep it up! Hey Occavatra! Just wanted ot stop by and say your weapons are awesome too! Sorry for forgetting to mention that before. @LigerBeard It's okay, man. Thanks for saying that you enjoyed the weapons I made. It really means a lot to me. By the way, I hope you've made your decision about whether to redesign one of your characters or not. I took a peek at it sometime yesterday while the link was still there and thought the original design was pretty nice. A powerful dragonlike spear fueled with fairy magic as bright as the dawn. Dragonlord Occavatra forged it before he gave it as a gift to Melissa, a true warrior and a freedom fighter who will not let anything destroy their passion to protect magic. Happy New Year, everybody. I hope you all had a wonderful Frostval and happy holidays because I'm starting off 2017 with the Frostval Storybook Collector's Edition, which was really challenging for me to design because most of the art featured except for the Ice Crystals and the Frostvale moglins was made entirely by me. I owe that effort all to Ergotth for suggesting that I should have a snowman and scattered ornaments around the pedestal, which gave the floor surrounding the pedestal where the book rested on a more colorful, festive feeling. The two moglins that are playing with each other sure seem to agree on that. Unlike the other Frostvale moglins, they were given a sort of magic pocket watch that made them immune to the effects of the merging timelines from two years ago. These watches were souvenirs from Occavatra and co. after they were finished distributing the copies of the seasonal storybook collector's editions to average citizens in the Kingdom of Greenguard. Since then, they do not mind appearing different from their fellow moglins because all of the moglins know the true meaning of Frostval well; to work together. 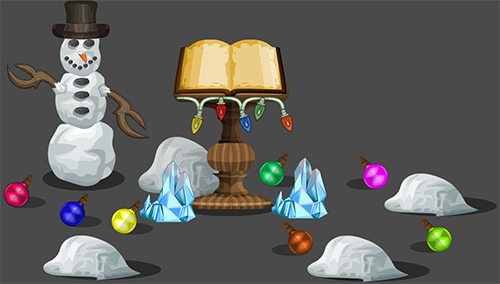 Below the link the animation is a link to the winter items I made for EpicDuel, which are basically the same decorations used to decorate the storybook except the wiring is colored differently, there are more colored lights, and even more colored ornaments. I'd like to thank Bido, Charfade, and Nightwraith for their advice on working with snow because building that suspicious-looking snowman was a fun hobby to get into. How it got from Delta V to Lore and what its true motive is remains widely a mystery, but as it stays hidden, it watches its surroundings while plotting its nefarious scheme as it waits to come to life. When it does, be sure to bring a fire weapon along with you. It sounds like my kind of weapon anyway. I do hope you'll enjoy them. 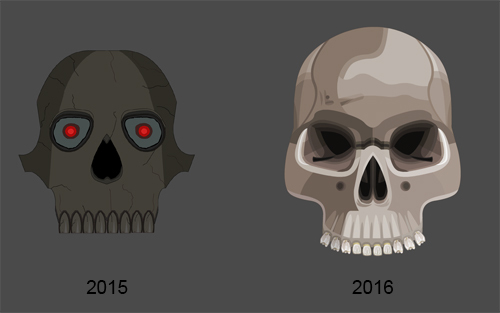 Compared to two years ago and last year, the skull on the right is more circular than the one on the left especially its white teeth. I'd like to thank Deuce for lending a hand in helping me polish the teeth just right and Charfade for advising me on how the teeth are arranged on a skull and her overall encouragement while I shaded and applied darkened textures and shadows all around the skull to give it its current lifelike appearance. I was on a bit of a hiatus with the construction of my redesigned skull, but tonight, I finally got a chance to finish it off so I can use it in my future projects. Just dropping a comment that your art here looks very well done, and it's also really clear that you're improving from year to year! I think my favorite piece currently is the bright red armor you have for Occavatra (Book 3), both the style itself and the dramatic colors that match with it. These look awesome. My favorite is definitely the Headstrong Tower Blade. Would love to see more. Shadow Warrior is Best Warrior! @Starflame13 Thank you so much, Star. This really means a lot to me and it's wonderful to showcase how I came as my studies advance to see how far I've come. 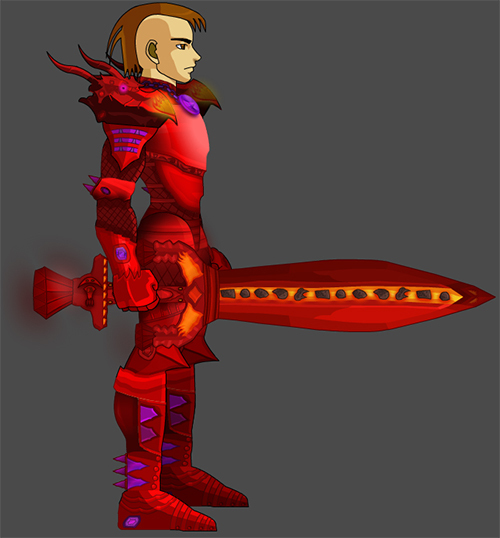 ^_^ I'm glad that you enjoy the red armor that Occavatra wears in Book 3. It's a homemade dragonlord armor that he made from scratch with the use of ancient relics, colored metal, and crystals that he collected during his travels over the years. It never hurts to stand out from the other dragonlords that wear the common armor.